Exporter of a wide range of products which include hot press machines. We are the principal manufacturer, supplier and exporter of Hot Press Machine that is hydraulically operated steam/thermic fluid daylight device that is provided with up closing frame. 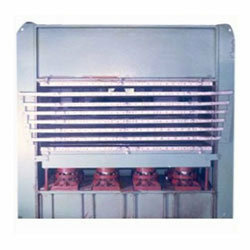 Its main body is designed, using optimum quality mild steel plate, and hot platens are also fabricated from solid plate. Apart from this it is available with power pack, steam connection pipes and other necessary components at affordable prices.